Features POW/MIA logo on front left breast with Tri-Base Chapter underneath. 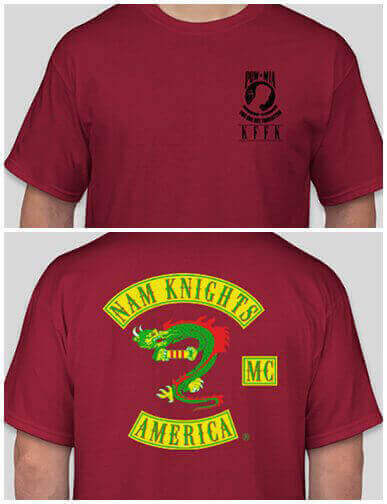 The Club Colors (Vietnam Ribbon or American Flag) on the back. Across the country, every Friday has become known as RED Friday, a day each week when we as citizens, veterans, domestically stationed military, etc., can take a moment and honor those who aren't safe at home with their families, because they choose service before self. Features RED boot logo on right sleeve. 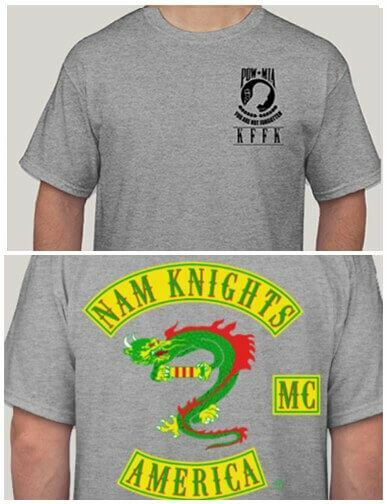 Features POW/MIA logo on front left breast with KFFK underneath. 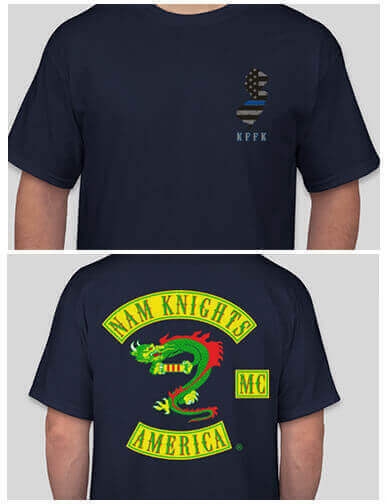 Features black and gray New Jersey with a Thin Blue Line going through it on the front left breast with the Club Colors (Vietnam Ribbon only) on the back. Featuring the Tri-Base Chapter logo covered in beveled enamel for a smooth finish. Reverse side features the Club Colors with the words Loyalty, Honor, Respect, Brotherhood engraved above. 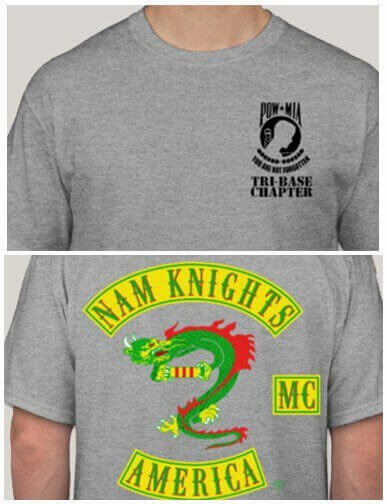 Below are the three bases that the Chapter is named after, McGuire-Dix-Lakehurst. Barb wire (polished nickel) is cut out for a radical look. Comes with vinyl protective case. We have partnered with Old Jim Customs to bring you these one of a kind custom laser etched head plates - in full color. Cut from billet, aircraft aluminum, powder coated, laser engraved, and colored using 720dpi full color processing. They install in seconds with heat resistant 3M peel and stick acrylic tapes and won't damage the finish or leave any residue when removed. Head Plates fit the cylinder heads of virtually all Harley-Davidson Milwaukee 8, Twin Cam, Sportster or Evolution engine styles (sorry no V-Rods). Will fit engines equipped with head bolt covers and spark plug collars. 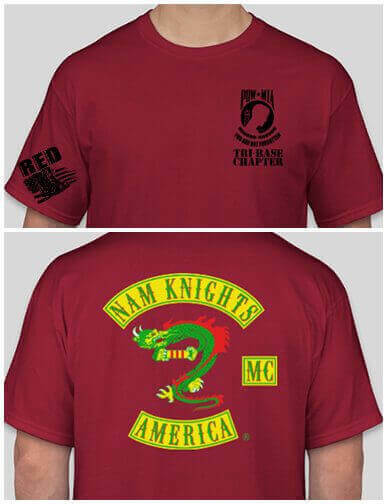 Choose from Vietnam Ribbon Club Colors, American Flag Club Colors, Canadian Flag Club Colors, and KFFK. 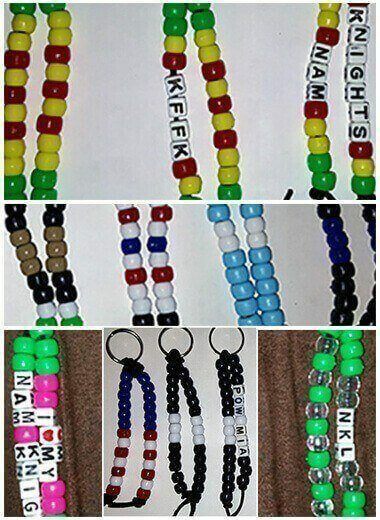 Custom engraved orders are also available. Note: When installing, clean the cylinder head with alcohol or brake cleaner to remove any residue. We have partnered with Old Jim Customs to bring you these one of a kind custom laser etched head plates. Cut from billet, aircraft aluminum, powder coated and laser engraved. They install in seconds with heat resistant 3M peel and stick acrylic tapes and won't damage the finish or leave any residue when removed. 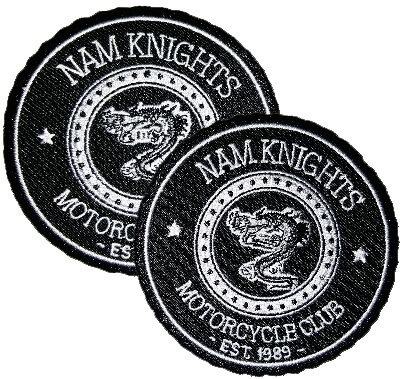 100% Embroidered Patch. 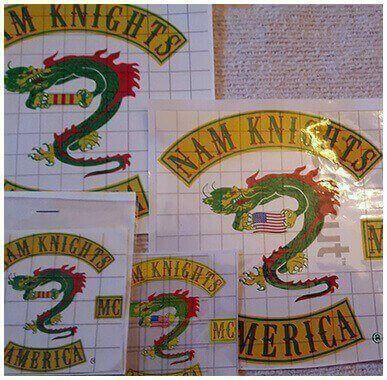 Nam Knights Motorcycle Club Est. 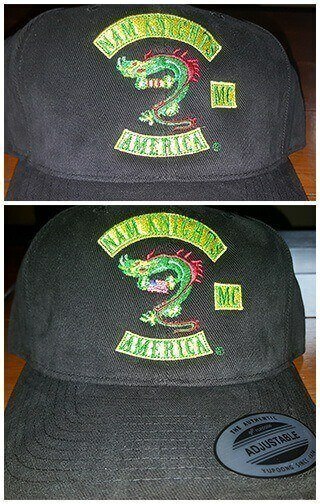 1989 in either Vietnam Ribbon or American Flag Club Colors. Vietnam Service Ribbon or American Flag. Features embroidered Club Colors on front. Adjustable back. Available in Vietnam Ribbon and American Flag. 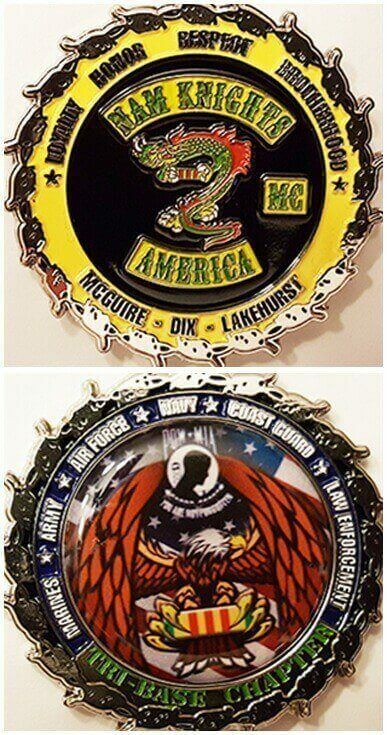 Available in 3" x 3" and 6" x 6"
Polished nickel challenge coin. Engraved on both sides. 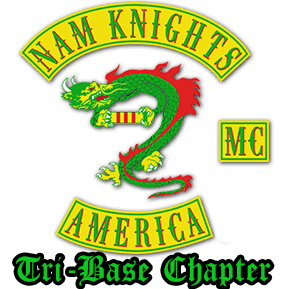 Featuring the Nam Knights Motorcycle Club colors on one side with Tri-Base Chapter - KFFK above and below are the three bases that the Chapter is named after, McGuire-Dix-Lakehurst. The reverse side features the American Bald Eagle with the Branches of Service, POW/MIA, and Thin Blue emblazoned in a star with the words "In Memory of Those Who Made the Ultimate Sacrifice". Barb wire is cut out for a radical look.